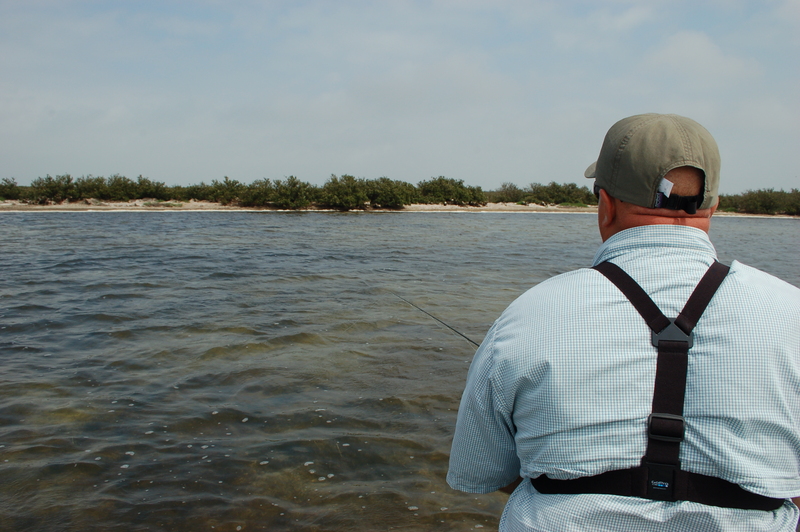 The Spring and early Summer of 2011 has been riddled with very tough fishing conditions. Relentless winds (characteristic of our region’s returning drought conditions), have rendered many days virtually unfishable, and left only a modest cluster that could be reasonably considered for fly fishing. Weather is weather and there is nothing any of us can do about it, but after a while nagging conditions become frustrating for everyone and they leave farmers and fishermen alike watching and waiting for a break. 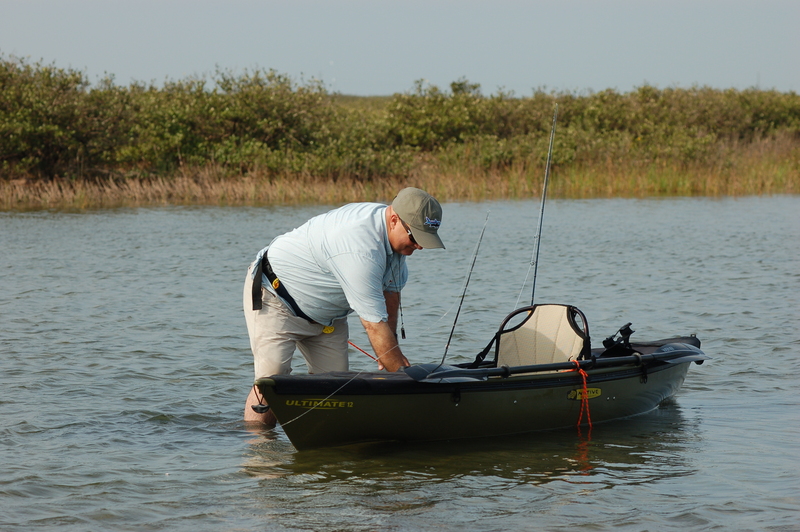 Taking advantage of what appeared to be a few days of tolerable weather recently, I met a friend of mine, John Carpenter, in Aransas Pass for a kayak fly fishing trip. 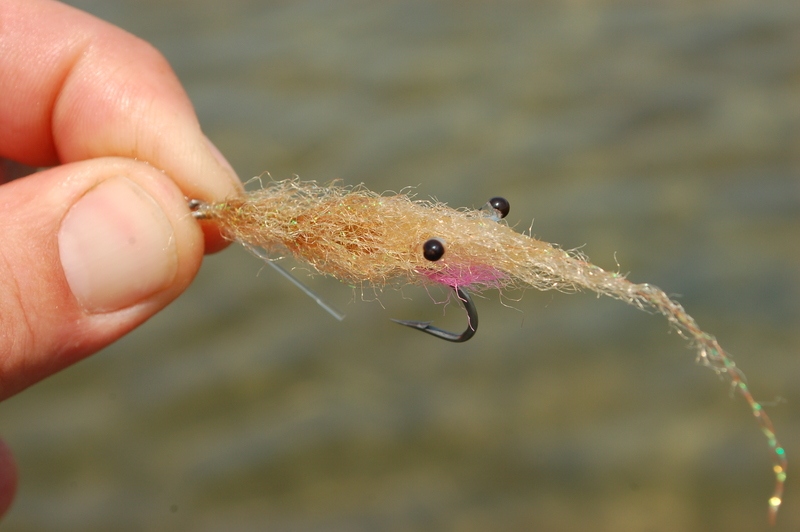 John is an expert fly tyer who creates some very compelling flies. He’s also a talented artist with a keen eye for design detail. I always look forward to seeing what he can crank out at the vise. good. But several hours later as I neared the Coast, the truck was wavering against a powerful southeast wind that pushed the cane breaks over. It was obvious there would be no lapse in the windy weather after all. John and I met outside of AransasPass and unloaded our boats in the 20-knot gusts. We were disappointed with the conditions, but happy to smell the salt air. So, we strapped our hats down, cinched our life jackets tight and paddled toward the protection of a place called the Lighthouse Lakes. The Lighthouse Lakes is a labyrinth of shallow lakes, flats, islands, and sloughs near Aransas Pass. It is a well-known destination for kayak anglers and skiff fishermen. 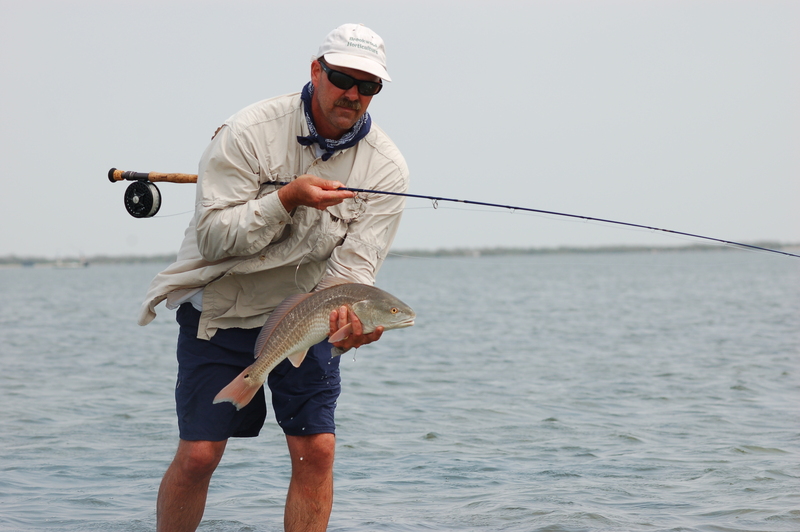 In spite of its popularity among anglers and location near the congested tourist towns of Port Aransas and Rockport, the natural beauty and integrity of the Lighthouse Lakes remains relatively unblemished. It is a wonderful place. fish, and I sincerely hope it remains clean and wild for years to come. Lakes. 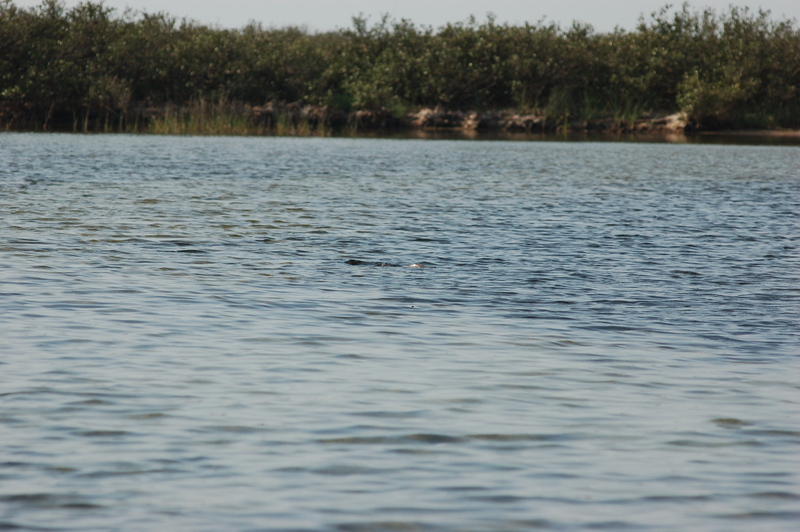 We cut through a narrow slough along the outer shoreline and entered the Lakes. From there we paddled another half mile back to a slender passage that popped out on a large shallow hard-sand lake. A prominent and unpleasant wind raked across the lake, pushing against our boats and leaving the surface streaked in white lines. To our right was a broad expanse of very shallow water with the east shoreline barely visible in the distance. On the leeward shore to our left, the mangrove roots and exposed sandbars were trimmed in foam and small bits of floating grass. No doubt, the wind was going to be a nuisance, but otherwise the conditions were tolerable. The temperature was mild, the skies were blue, and the water was clear. That was good enough for us. We hopped out of our boats and started wading across the seemingly endless expanse of ankle-deep water. line and after making 2 or 3 terrible casts, I managed to drop a small gold fly about 5 feet in front of him. The red surged toward the fly, took one look at it and then blasted toward the horizon. “Well… you blew that one.” I thought. We continued ahead, wading quietly and scanning the choppy water for any signs of life. About 20 yards up, we spotted two more reds rolling on each other in the short choppy waves about 6 feet off the bank. John made several false casts and then plinked his fly near them. The reds saw the fly and sulked away, clearly irritated at the interruption. It was disheartening. Things seemed to be quickly shaping into one of those frustrating outings where you find feeding fish, but you can’t catch them. I took it as a cue to try a more subtle approach and tied on a small brown shrimp fly that had always been a great producer. It was worth a shot. We waded another 50 yards and I glanced back over my left shoulder at some “used up” water. I suddenly saw a group of 3 reds grinding down the bank headed away from us. We had missed them. I made an awful-looking Hail Mary cast at them. I knew full well there was no way this cast was going to hit the mark, but figured, “Why not try.” Somehow the wind-blown fly landed right in their path. One of the fish rushed the fly, wolfed it down, and the fight was on. Yes! It appeared these fish must be feeding on small shrimp. The same scenario repeated itself throughout the remainder of the half-mile-long wade. The wind was just plain bad and it made casting really tough, but fortunately there were plenty of fish. John and I both experimented with a variety of patterns and presentations, but the only flie drawing consistent strikes were small brown, nearly inert-looking, shrimp patterns. 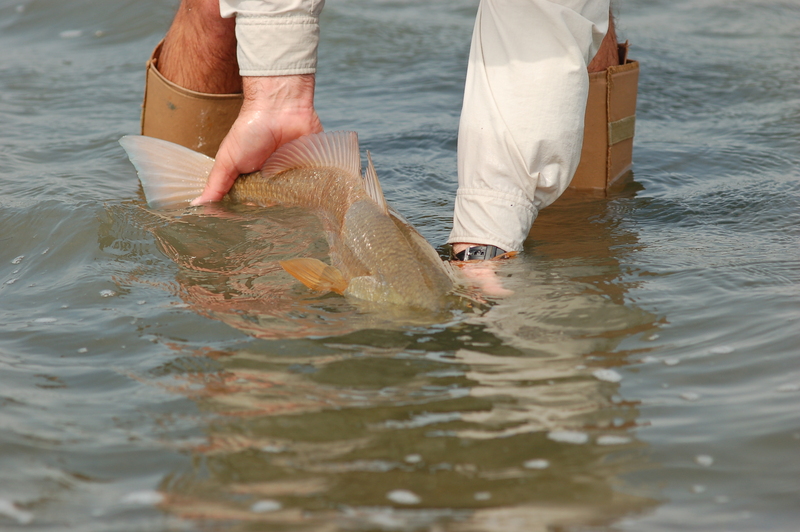 As the day drew to an end, we ended up landing a handful of reds, losing a few, and scaring the Hell out of a bunch. On the paddle back to the truck that evening, John and I talked about how funny it is that a rough old redfish digging through the sand can be so selective in what he chooses to eat. Just when we think we have them all figured out, they remind us we don’t! I guess that’s why we keep coming back for more.